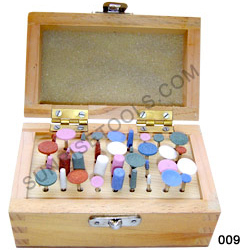 Description :- Beautifully crafted Bur box contains 36 burs and used for storing burs. Made from good quality wood for long lasting. 009 Bur box containing 36 burs. 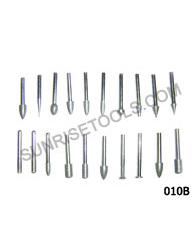 Description :- These high quality manufactured diamond burs are excellent for polishing and final finish of diamond. 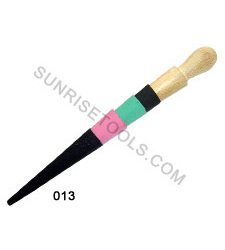 A must have tool for jewelry makers. 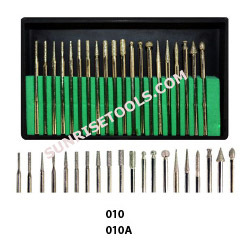 Description :- The diamond burs are used for preparation of hard tooth tissues,old filling removals and for fillings processing and polishing.The Diamond Burs precise stem that is made of stainless steel ensures firm grasp in turbine. 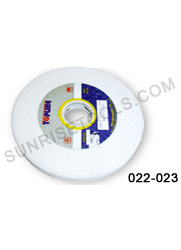 Description :- This emery paper is best for grinding and smoothening surface of metal. Description :- This high quality manufactured emery shell is to be mounted on a spindle which is used for grinding and smoothening of metal. 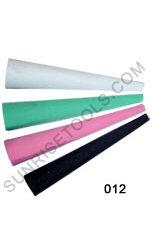 Emery shell is available in a set of 12 grits. Description :- Emery shell is to be mounted on a spindle and available in a set of 6 assorted grits with wooden cone. 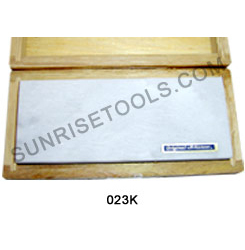 This is a great tool for polishing the inside of rings of all sizes and provides best surface finish. 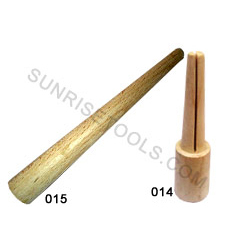 Description :- Wooden mandrel comes in conical shape and split cylindrical shape with 4" length and is used to hold ring while you are working. 014 Wooden Mandrel - Spindle Overall Length 4"
Description :- Emery stick is used just like a file, which helps to provide a solution for sanding and polishing all materials like gold, silver, brass etc. 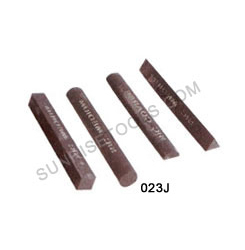 Description :- These stones are made from best quality silicon carbide that is procured from the reliable and certified vendors of the industry under well equipped production unit. 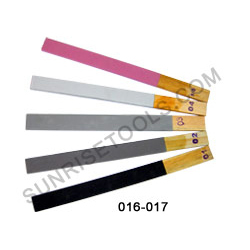 This is best for edging or sharpening the product. 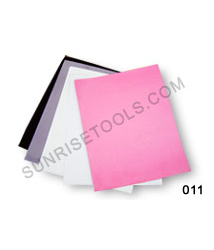 Highly durable and long lasting. 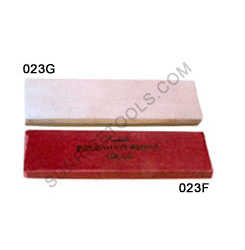 Description :- Emery Stone White for Mineral Glass Edging very useful for jewelers to grinding and smooth work. Description :- These stones are widely used in Jewelry Industry to test the purity and quality of gold karat. 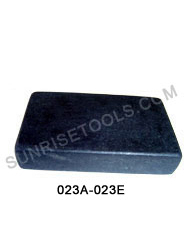 Moreover, these Gold Testing Black Stones are well appreciated for their durability, tensile strength and dimensional accuracy. 023A Gold testing black stone 2½" X 1½" X ½"
023B Gold testing black stone 3" X 2" X ½"
023C Gold testing black stone 4" X 2" X ½"
023D Gold testing black stone 6" X 3" X ½"
023E Gold testing black stone 8" X 3" X ½"
Description :- Jewelers polishing Stone very useful for jewelers to polish and smooth work. 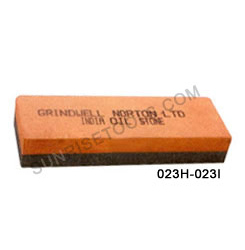 023H India Stone Red Fine 6" X 2" X 1"
023i India Stone Combination 6" X 2" X 1"
Description :- Emery grinding stone is very useful for jewelers to grinding and smooth work. 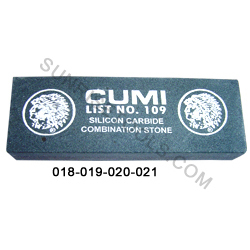 Description :- Top quality stone for workable for the jewelers and quality is superb for Stone Arkansas.